I am originally from Montgomery, Alabama, but I have lived in Auburn, Alabama for the last 5 years while I was in school. My favorite movement is front squats. My least favorite movements are anything that could even slightly be considered cardio. Running, box jumps, and burpees are all just terrible. 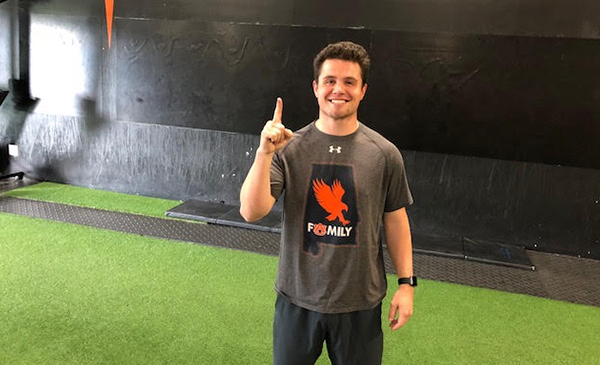 I had previously worked out at a CrossFit gym back in Auburn, but when I first came to CFN I had not worked out in 4 or 5 months. Which is making getting back into the swing of things super hard. Some co-workers told me about CFN and since it’s so close to work, it’s a perfect place to work out. Although I am not playing any other sports currently, I am trying to find a good slow pitch softball league here in town. I try to go as many times as possible, but as of right now it is appearing that 4 days a week is what I am able to make happen. I grew up playing baseball my whole life, but obviously do not play anymore. Played a ton of intermural sports at Auburn. Also, I was a cheerleader for Auburn for 3 years so it was definitely out of my comfort zone getting into that. “Oh no. What have I done? I messed up big time. I wonder if I can opt out of my membership already.” Thankfully, it got better. My favorite memory has been and still is getting to meet the great people. Friendships that are developing are awesome and I am looking forward to getting to know more people and know them deeper. I eat horribly. I do not eat fruits or vegetables at all, but I am trying to force myself to eat them so I won’t die at 30. As of right now I pretty much exclusively eat meats, bread, and grains. I don’t drink anything except water and milk. No beer, soft drinks, wine, etc. When I first got to CFN, I weighed about 187ish. I am now at 175 and feel as if I am overall just living a healthier lifestyle. My spiritual, mental, and physical health have all improved. I have found myself growing closer to God. I am growing happier in life while knowing how incredibly blessed I am with great health, a family that loves me, and incredible friends that would do anything in the world for me. As of right now, I work for United Rentals. I rent out construction equipment to contractors all over the United States and Canada. When I originally signed up for CFN I wanted to fill a void of time that I have between getting off work and the time that I go to bed. “Idle hands are the Devil’s workshop.” –Proverbs 16:27 Creating an active mind and an active body were key parts of joining CFN, but making friends and meeting new people is so important to me. I can talk to a brick wall for a half hour so making more friends means the family is just growing larger.